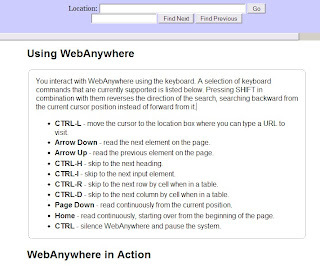 WebAnywhere is a web-based screen reader for the web that is a research product of University of Washington. It dose not require any software or equipment in your computer, and it also helps blind people enjoying surfing online. Actually, it looks like an online tool that can running on any machine and operation system. After you enter its main page you will see that it uses a proxy.php frame to surf website, and you can use keyboard to pick content for reading. But for me it seems hard to use these keyboard commends. Now, WebAnywhere is only an Alpha version, but it still useful.